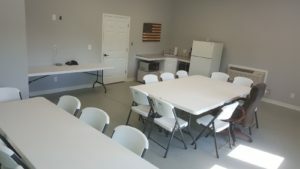 A small idea for a “little” prefab building to store equipment and hold meetings changed into a beautiful building on main street that houses a fitness center and a meeting room. Multiple grants, including one from the Hansen Foundation, and local fundraising supported the project. Local contractors and vendors were used as much as possible. A weedy empty lot became a beautiful addition to Main Street. As the project progressed an amazing thing happened … other properties improved the looks of their entities as well, enhancing the look of the whole community!